A new paper by the Ryerson City Building Institute and Urbanation examines condos under development in the GTA to understand how well the incoming supply will accommodate the region’s housing affordability challenges and changing demographics. Bedrooms in the Sky: Is Toronto building the right condo supply? 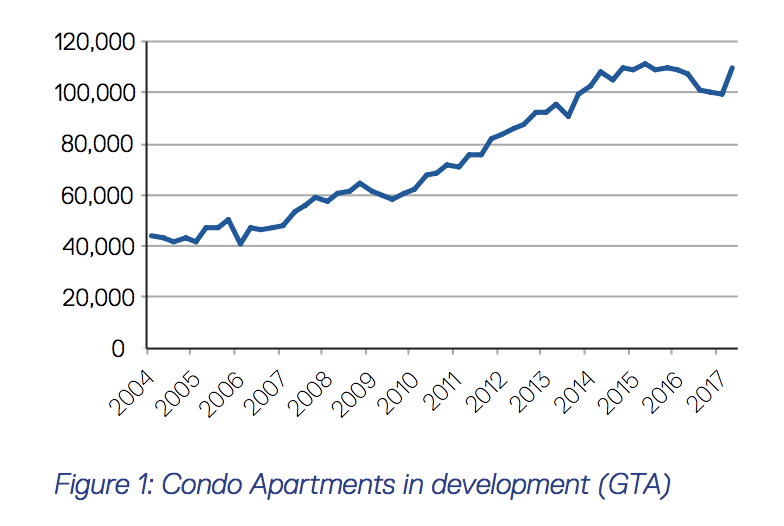 finds that 94,000 condo apartments will be completed in the GTA over the next five years–the highest number on record–and most will be in buildings over 20-storeys. At the same time, in the City of Toronto, only 38% of condo apartments in development are 2 bedrooms and larger. “We are building an all-time high of condos, but not enough missing middle housing that is suitable for a range of family sizes and income levels,” says Cherise Burda, Executive Director of the Ryerson City Building Institute. 41% of condo units in development in the GTA are two-bedrooms and larger. In the central 416, it’s 36%. Condo units in buildings under 12 storeys are being built in greater proportions in the 905, representing 31% of all multi- family housing units coming down the pipeline. In the central 416 area, condo apartments in buildings under 12 storeys represent only 7% of total units currently in the pipeline. In the central 416, 80% of new multi-unit homes in the pipeline are in buildings over 20 storeys; over half are in buildings 36 storeys and taller. Between 2016 and 2026, the 35 to 44 age bracket is expected to grow by 207,000 residents and drive increased demand for larger, more family-friendly housing.